San Miguel de Allende, Mexico, has long been a destination for U.S. citizens. International retirement migration streams can affect the economies and communities of favored retirement destinations, sometimes profoundly so. Retirement abroad, much like tourism, can be a powerful form of direct foreign investment and thus contribute to development efforts in other countries. Retirees buy or rent homes, provide employment for local workers, consume goods and services, and may attract greater investments and more foreign visitors to retirement areas. In recent years, a steadily growing stream of Americans has been heading south to Latin America for retirement. And as the baby boom generation ages, that stream is expected to gain speed. It will be carried along by rising medical costs, a reduced ability to rely on Social Security and pensions, and cheaper transportation and communications technology. A growing body of literature examines international retirement migration, but comparatively little is known about Americans who have retired to Latin America, especially outside Mexico; why or how they decided to retire there; and what their experiences are in their new communities. The Migration Policy Institute sought to add to this literature by investigating the U.S. retiree population abroad through quantitative analysis and examining retirees' experiences through qualitative research. The investigation focused on two countries — Mexico and Panama — that have exhibited dramatic growth in their U.S. retiree populations in recent years. Mexican and Panamanian census and administrative data were analyzed to determine the size and demographic characteristics of American seniors living there. The sites were chosen from a list of locations with the largest- and fastest-growing U.S. retiree populations, according to census data from both countries and anecdotal reports from Internet sites, news articles, and persons familiar with retirement communities in Panama and Mexico. In Panama, two focus groups were conducted in Coronado, two in Panama City, and one in Boquete; four were conducted in San Miguel de Allende, Mexico. Discussions in these focus groups and in 17 interviews with key informants explored the decision-making process retirees use to move abroad, their integration experiences in new communities, and their perceived social and economic impacts on local communities. A variety of purposive sampling techniques were employed to recruit focus-group participants, utilizing personal networking, targeted announcements to social and charitable organizations and online forums frequented by U.S. retirees, and advertising in an English-language newspaper in Panama. Several subsequent volunteers used their own networks to spread word of the study. Some moderators of blogs and Web sites related to retirement in Panama or Mexico posted the study's description on their sites. Although the focus-group findings cannot be considered representative of all retirees in these countries, the variety of recruitment techniques reached a diverse group of participants in each area, and the experiences they shared shed light on some of the broader issues and challenges facing retirees in Mexico and Panama. Despite the growing importance of U.S. retirement abroad, data on the numbers of U.S. citizens abroad — much less numbers of retirees, their settlement locations, or their effects on and interactions with local communities — are meager and incomplete. The U.S. Census Bureau does not collect this information, and while the Department of State (DOS) used to issue estimates of U.S. citizens abroad, it no longer does so, citing security concerns. Host-country censuses from 2000 are one source of data on U.S. citizens abroad, and the following analysis is based on census data from Panama and Mexico. Unfortunately, one drawback of destination countries' census counts is that they may have missed part-time residents not present at the time the census was conducted. Further, census data from 2000 miss the most recent flows of retirement migrants, who likely make up a large portion of the U.S. retiree population in Mexico and Panama. For this reason, the most recent data on Panama's retirement-related visas issued to U.S. citizens was included; this data was unavailable for Mexico at the time the research was conducted. Between 1970 and 2000, the overall size of the U.S. population — not just retirees — living in Mexico grew steadily, while the growth of the same population in Panama was less consistent (see Table 1). Mexico saw the greatest proportional increase between 1970 and 1980 (57.6 percent) and between 1990 and 2000 (84.3 percent). Source: Numbers for 2000 for Mexico are from IPUMS; counts for Panama are from CELADE. The story was slightly different in Panama, where the number of U.S.-born individuals living in the country declined from 1970 to 1990 before increasing 57.8 percent between 1990 and 2000. The earlier declines may reflect increasing political instability and the decreasing presence of U.S. Canal Zone residents after the United States agreed to hand over the canal in the late 1970s. The growth between 1990 and 2000 is likely to have been caused by two factors: growing U.S. migration to Panama during the period following the overthrow of Manuel Noriega in 1989, and an increasing number of former U.S. military personnel and canal workers settling in the country permanently. The U.S.-born population aged 55 and older grew dramatically between 1990 and 2000 in big retirement areas and some border communities. While nationally it increased from 24,090 to 28,247 people, or 17 percent, rates of growth were much higher in some states. States that experienced large growth in this population were Jalisco (3,438 people or 138.6 percent), Baja California (1,467 people or 43.5 percent), Baja California Sur (846 people or 188.0 percent), and Guanajuato (434 people or 26.0 percent). Several states along the border, as well as the Federal District, actually saw their population of U.S.-born seniors decline over this period (see Table 2). Tamaulipas experienced a 27.8 percent decline (626 people); Chihuahua a similar 27.4 percent decline (578 people); Sonora a 31.5 percent decline (475 people); and the Federal District a 20.3 percent decline in this population (464 people). Source: IPUMS International data derived from the 10.6 percent sample of the XII General Census of Population and Housing of Mexico, 2000. In examining the population of U.S.-born seniors in Mexico, it seemed the census data captured two groups: Those joining in the growing trend of retirement abroad, and those who were likely born to Mexican migrants in the United States and then moved back to Mexico at some point in their lives. All of the 10 Mexican states with the highest concentrations of U.S.-born seniors were either states along the U.S. border or states containing large, established U.S. retirement communities. Given that not all U.S.-born seniors are retirement migrants, growth in border states and communities may be partly due to aging U.S.-born descendents of Mexican migrants, as opposed to increasing migration. However, it is likely that growth in retirement communities can be attributed to the growing trend of U.S. residents retiring in Mexico. Source: IPUMS International data derived from the XII General Census of Population and Housing, Mexico, 2000. Data on the municipalities experiencing the largest growth in this population between 1990 and 2000 show some similar trends. Among the fastest growing municipalities were Chapala (2,907 people or 581.4 percent), a well-established retirement community of U.S. and Canadian expatriates; Mexicali (1,446 people or 116.6 percent), a border community in Baja California; and retirement destinations Los Cabos (709 people or 308.3 percent) and San Miguel de Allende (210 people or 47.7 percent). The census data show notable differences between the populations in border states and retirement states. U.S.-born seniors in retirement states are better educated than those in border states; draw larger retirement incomes; are more likely to receive private rather than public medical care; have larger houses with fewer inhabitants; and are more likely to own computers. These differences tend to be even greater between all U.S.-born seniors and their native Mexican counterparts. Census figures may not adequately capture the U.S. retiree population in Panama because many retirees may have come after the 2000 census was completed. Additionally, Panama's 2000 census data on the foreign-born population are much less detailed than those from Mexico. Limitations aside, census numbers do show a growth in the U.S.-born senior population between 1990 and 2000. According to Panamanian census data, the number of U.S.-born seniors aged 55 and older residing in Panama grew from 491 in 1990 to 1,159 in 2000, an increase of 136 percent. Visa statistics reported by Panama's Migration and Naturalization Directorate show that in the two visa categories most likely used by retirees — the pensionado and rentista — the number of visas issued to individuals from the United States more than tripled between 2003 and 2005 (see Table 3). *Includes both regular and permanent visa types. The issuance of forestry investor visas has been temporarily suspended by the Panamanian government. Source: Sections of visa and legal counsel reports from the Panamanian Migration and Naturalization Directorate. The number of visas issued in other visa categories for which retirees might be eligible — investor visas for small, regular, and forestry businesses, and economic self-sufficiency visas — have also grown. Data from January to March 2006 indicate that this trend is likely to continue among visa categories open to retirees: Almost the same number of visas were issued in the first three months of 2006 as in all of 2003. Pensionado visas made up the bulk of the increase, accounting for 90 percent of the selected visas issued to immigrants from the United States between 2003 and March 2006. Retirees seek information about potential destination countries from a wide range of sources, particularly the Internet, and a sizable share considers multiple — and far-flung — retirement countries. Focus groups with retirees in both Mexico and Panama indicated that many used the Internet as a tool to explore possibilities for retirement abroad. And while some retirees, particularly those in Mexico, considered only one or a few countries as retirement options, many considered multiple countries across continents, including Thailand, New Zealand, South Africa, and Malta. Their wide net hints at the impact of globalization and technology advancements on retirement migration and may signal a growing trend toward multiple moves during retirement, as retirees "shop around" for the best conditions. While retirees often choose retirement destinations based on inherent characteristics of a place — climate or local culture, for example — focus-group respondents in both countries also indicated that visa, tax, and property policies had been important in their decision. Indeed, state policies, both of the United States and destination countries, can promote or deter retirement migration; academic research traditionally identifies these characteristics as "push" and "pull" factors. Among the important attractions of both countries was the ease of obtaining a visa as a foreign retiree. Mexico has both immigrant and nonimmigrant rentista visas for persons of any age who do not work in Mexico and are economically self-sufficient; individual applicants must have income from investments and/or pensions of $1,000 a month, and couples must have $1,500 a month. Immigrant visas are intended for those wishing to remain permanently in the country, while nonimmigrant visas are available to those intending to stay in the country for a limited duration. Both types of visas are valid for one year, and they may be renewed for another four years. After that point, nonimmigrant visa holders may apply for an immigrant visa, and immigrant visa holders may apply for inmigrado (lawful permanent resident) status to remain in the country. Panama has two visas — the pensionado and rentista — that specifically target retirees; in addition, some retirees may qualify for economic self-sufficiency visas. Applicants for a pensionado visa in Panama do not need to be of traditional "retirement age," but they must be retired (no longer employed, at least in Panama) and receive government or private pensions of $500 per month, or $600 per month for a couple. The pensionado visa allows retirees to remain in the country indefinitely, although they are not eligible for citizenship with this visa type. Retirees who do not receive regular pensions may instead apply for Panama's rentista visa. Rentista applicants must place an amount of money — now hovering around $225,000 — in a five-year certificate of deposit at the National Bank of Panama in order to yield at least $750 in interest per month. The rentista visa, unlike the pensionado, allows its holders to obtain a special Panamanian traveling passport, though like the pensionado, it does not confer Panamanian nationality. The rentista visa must be renewed every five years. Further evidence of the important role visa policies can play in drawing retirement migrants to a particular country is the example of Costa Rica. Focus-group participants reported that because Costa Rica significantly scaled back the incentives associated with its pensionado visa in the last few years, some retirees who were interested in retiring there moved to Panama instead. Some U.S. retirees indicated that American policies had pushed them to move abroad, citing health policies that have not contained medical care expenses and post-9/11 policies that have curtailed civil liberties. The U.S. policy retirees cited most was related to Medicare. Presently, Medicare benefits are not internationally portable, meaning that age-eligible Americans living abroad cannot access the program without returning to the United States. Some focus-group participants emphasized that medical care was a serious consideration in their move, since they would have to travel back to the United States to take advantage of their Medicare benefits or invest in a new insurance program abroad. Many emphasized that a policy change providing Medicare coverage abroad would benefit both American retirees and the U.S. government, since treatment in Panama or Mexico would cost much less than it would in the United States. Economic factors appeared to weigh heavily on retirees' decisions to move, both in the consideration of destination countries and in the initial decision to leave the United States. During the focus groups, participants were asked to list on paper the top factors they considered when choosing where to retire. Approximately three-fifths in Panama listed some type of economic consideration as their number-one factor. A smaller share — approximately one-third — who answered the question in Mexico listed economic factors first. Several participants in Panama said they would not have been able to retire if they had stayed in the United States. One participant in Panama stated, "I could come to Panama and retire, or stay in Florida and work." Others in Panama indicated that moving abroad was a way to maintain, as retirees, the quality of life they had enjoyed in their working years, or to enhance that lifestyle. Participants in Mexico focused somewhat less singularly on economic considerations, incorporating comments about cost into a broader set of factors that influenced their decisions. Still, cost of living was the first or second factor that every focus group listed aloud when asked about the factors that were important in considering a move abroad. Among those who chose to retire in Mexico, other countries for retirement, such as Israel, Italy, or France, were ruled out due to higher costs of living. They also had decided against countries in Central and South America because of more expensive travel to and from the United States. In Panama, where the government has instituted a wide range of discounts for seniors on prices for entertainment, meals in restaurants, hotels, utilities, and medical care, focus-group respondents often said they had been both aware of and attracted to this offer when they were deciding where to retire. Participants in Panama also highlighted 20-year property tax exemptions on all newly constructed homes, while retirees in Mexico likewise spoke favorably of the low property and other tax rates. Other retirees noted that they could no longer afford health care or were not eligible for health insurance in the United States, which prompted their moves. In addition to the cost of medical treatments and doctor's visits, retirees in both countries explained that the availability of inexpensive in-home care made a move abroad an alternative to purchasing insurance for long-term care or paying for expensive care in the United States. The degree to which retirees integrate in host countries varies by person and over time, and many retirees cite language as the primary challenge in adapting to their new communities. Focus-group findings echo earlier studies examining integration of foreign retirees into local communities. Few retirees in the focus groups were fluent in Spanish, which made some interactions in both Panama and Mexico difficult. However, many retirees said they aspired to learn Spanish and referred to Spanish lessons or tutoring, either in the United States or in their new communities. Of the retirees who knew little Spanish, respondents indicated certain situations in which language was a particular barrier. They noted they could often use hand signals or rely on people who were bilingual, but they said Spanish was crucial in any government or other official interactions. Respondents also noted building a home was difficult without some knowledge of Spanish, since most construction workers cannot speak English. In contrast, respondents did not mention having difficulty finding attorneys, insurance brokers, or real estate agents who spoke English. Respondents in Mexico and Panama varied in the degree to which they participated in local community organizations and lived in neighborhoods with local people. Some retirees in San Miguel de Allende noted a trend toward the formation of retiree "enclaves." Retirees mentioned that the local expatriate community was a great source of assistance in the adaptation process. In both countries, retirees remarked how open the foreign community was to newcomers and how much information this network could provide. The economic impact of the retiree population on a local community is difficult to measure. However, retirees clearly brought an influx of capital to their communities. Focus-group participants repeatedly commented on their relative wealth, as compared to their Panamanian or Mexican neighbors. Of those focus-group participants who answered a survey question on their retirement income from Social Security and other private or government pensions, at least half reported a monthly income of over $2,000. Though the exact impact of this inflow of funds is unclear, the retirees shared their perceptions of their own impact, in some cases seconded in key informant interviews with local real estate agents, attorneys, insurance brokers, government officials, and developers. In all focus groups, respondents referred frequently to the number of people they hired, such as construction workers, home nurses, or maids. In addition, many retirees (particularly in San Miguel de Allende) believed their community involvement as volunteers and philanthropists had a significant economic and social impact on local people. In Panama, some retirees mentioned that the construction boom had changed how people earned money. While many locals may have made a living from agriculture in the past — often selling food at local markets, for example — they now worked in construction or in other service jobs catering to retirees. In Boquete particularly, respondents said the boom in construction was bringing in-migrants to the area for jobs. In addition to services, retirees also said they increased demand for consumer goods in their community. Respondents noted they purchased food, furniture, and computers from local stores. In Panama, a large number of respondents had or were currently in the process of building their own homes, meaning they purchased materials for home construction. In all, retirees who made estimates said they spent considerable amounts of money in their newly adopted homes. One stated, "In 18 months, we figure that we probably have brought into this country $250,000 to $275,000." But while many retirees noted the positive impacts that migration brought to new communities, each focus group highlighted the drawbacks for local people, primarily increasing real estate costs. In all focus-group sites, respondents observed that the rise in housing prices had put pressure on local residents. 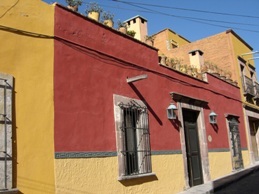 In San Miguel de Allende, which had the most established retiree community of the focus-group sites, participants said local people were moving to the periphery of the town, changing the demographic characteristics of the historic city center. Much can still be learned about U.S. emigration from existing data sources and qualitative research with migrants themselves. Census data from Mexico and Panama indicate that U.S. immigrants have become more numerous, especially in the past decade. States that are anecdotally known as retirement areas in Mexico also show a large influx of U.S.-born seniors in recent years. While state policies are not the only variables in retirees' migration decisions, they can act as strong incentives to move or to choose one location over another. Qualitative findings regarding the appeal of cheaper health care challenge the literature's depiction of retirees abroad as "amenity-seeking" migrants, indicating that they may also move for more basic needs. Focus-group findings also support previous research indicating that international retirement migrants are often a highly mobile subset of the U.S. population. Retirement migrants are an extension of increasing globalization, where people, as well as goods and services, flow more freely across borders. American retirement migration abroad could benefit both retirees seeking a higher quality of life and countries seeking an influx of foreign capital. But that mobility presents a challenge to countries wishing to attract this population. Retirees may move again, not only due to changed circumstances such as the onset of illness or a spouse's death but because even better amenities or needed services can be found at a lower price elsewhere. Governments need to pay careful attention in order to anticipate the challenges transnational retirement migration may bring and to develop sound policies to steer the process toward a mutually beneficial course. 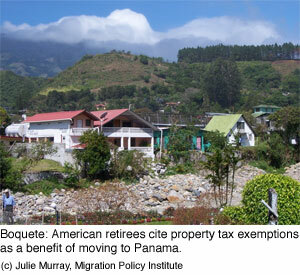 This article is based on the MPI report America's Emigrants: U.S. Retirement Migration to Mexico and Panama. The complete report is available here.